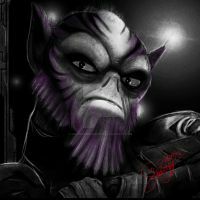 Zeb Orrelios was a Lasat rebel who manned the starship Ghost. He was a trained warrior on his homeworld and did not get along with the starship's repair droid, Chopper. I love this drawing! Zeb is my favourite Rebels character. Not a big fan of Zeb, but I love what you did here! It looks great! This is awesome, Skips.. I mean Zeb looks so cool here. Hey, this looks like an awesome poster. He looks more expressive than McQuarrie's first Chewie did, which is a relief. You do you feel about the new show. I find that it would be pretty amazing!